Investing in the Athena gives you the very best in return: top performance and features, ease of use, durability and styling. You also invest in the certainty of Emco Tech, the world’s leading manufacturer of ionization technology. When it comes to performance, technology, durability and features, the Athena represents the absolute zenith in countertop ionization. You want two things from an ionizer: clean and healthy water. To understand the techno-logical advancements you’ll find in the Athena, which create its outstanding performance, you should read the basics of how an ionizer works. Other considerations in performance are durability, or how long the unit will perform, and functionality. Research states that the ideal level for drinking alkaline water is between pH8.5 – pH9.5 with an ORP of -250mv. It is unimportant if an ionizer creates big -ORP numbers at really high levels of pH. For most people, water over a pH10 begins to acquire an unpleasant taste due to the heavy concentration of minerals. What is important is drinking water at the mildly alkaline levels of pH8.5 – pH9.5 with good -ORP. Of course the Athena will create the big – ORP numbers at the higher pH ranges, but it is designed to give you the best ORP at the lower levels of pH – the levels that you will actually enjoy drinking. That’s where the bang for your buck really is. The Athena is the proven leader in performance results in independent EPA certified testing. You want two things primarily from an ionizer: clean and healthy water. 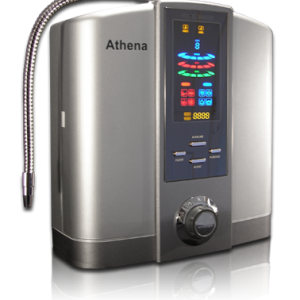 To understand the technological advancements you’ll find in the Athena which create its outstanding performance, you should understand the basics of how an ionizer works. Secondary considerations in performance are durability or how long will the unit perform, and functionality. 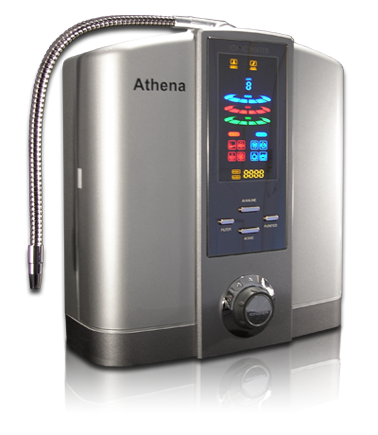 The Athena is the only Emco Tech ionizer that offers on-board dual filtration capability. It cleans your water to be 99.9% contaminant free, if using potable water source. The Athena incorporates a pre-filter and the revolutionary The BioStone Filtration system. The upgraded, proprietary patent-pending dual UltraWater filters are included with every purchase. The new patented Emco Tech Mesh Diode Electrode technology allows for its compact size. Do not be fooled by those manufacturers who claim that a large plate size is the key to ionization. It generally indicates less advanced and sophisticated technology. Click here to read about the Emco Tech Electrode Advantage in the Athena. Research shows that the ideal level for drinking alkaline water is between pH8.5 – pH9.5 with an ORP of -250mv. It is unimportant if an ionizer creates big -ORP numbers at really high levels of pH. Water over a pH10 begins to acquire an unpleasant taste due to the heavy concentration of minerals. What is important is drinking water at the ideal alkaline levels of pH8.5 – pH9.5 with good -ORP. An ionizer is an investment. You will want your investment to last. The electrodes are the crucial component in your ionizer. All other units on the market clean by a simple reverse polarity – which still allows some scale buildup. The Athena offers the patented new DARC (Double Automatic Reverse Cleaning) system. This new system will completely eliminate the mineral scaling from on the electrodes ensuring you will have many long years of healthy water. With other ionizers, you have to wait during a reverse polarity cleanse to use the ionizer. The DARC system cleans as you ionize – so you never have to wait for a cleaning cycle to complete. You never have to give cleaning a thought! Click Understanding Ionizer Cleaning Cycles to read and understand more on this revolutionary System. You will also want your ionizer company to be around to take care of your needs many years after you make the purchase. This point cannot be emphasized enough; in the last three years alone approximately 8 manufacturers have come and gone in the market place. With AlkaViva and Emco Tech you buy with absolute certainty that your company will be around to support you – long after some of the other companies have left you high and dry. Their combined 25+ years of experience and track record is unmatched. Period.